Selling real estate by auction is an educated choice, not a decision of desperation. Property owners once reluctant to offer their property at auction are now better understanding that auction is a viable option. If you have a timeline restriction, your property is in serious need of costly home repairs, if it is unusual, unique, or in great demand? Auction should be considered before all other methods. If the property is part of an estate, auction may be the only logical method due to the requirement for disposition of the personal property contents of the estate. There are more logical reasons to use auction than not too. Real estate auctions work great for those who have made a firm commitment to have their property sold by a specific date. 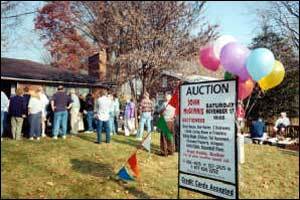 Real Estate auctions are highly beneficial for individuals who may be geographically seperated from the property. Only with auction can you establish a predetermined selling date, closing and possession dates, unlike other methods of selling when the buyer calls the shots and the seller has the feeling of losing control. Auction creates excitement, promotes a sense of urgency and generates a buy it now attitude. With auction the sellers will receive guaranteed offers from multiple buyers in an open and competitive bidding environment, while still maintaining maximum control. The typical method of selling real estate is usually determined by a single qualified buyer, who may have the financial means to purchase but only after the seller has made multiple concessions through a lengthy negotiation process. Usually with no guarantee of a successful sale and closing. At auction your property will be sold as-is with no costly presale home repairs. Your property will be sold as-is with no buyer's contingencies. With auction sellers have leverage over traditional sales methods because they are not subjected to the buyer contingencies such as loan approvals, home inspection reports, appraisals or any other contingencies which could stall or kill a traditional real estate transaction. With the Auction Method of Marketing, the seller and the auctioneer maintain greater control over the selling processes. We can control the access to your property through a predetermined preview and inspection period. With auction we require a substantial non-refundable down payment, this deposit can be as much as 20% of the total sale. Our advertising will be tailored around your property, it's location and the conventional real estate market. We will use selected media sources such as the local newspaper, trade journals, the Internet, direct mail, yard signs, street corner signs, and even cable television advertising to promote your auction. If we are requested to work with a specific Realtor we can also advertise your auction through the Multiple Listing Service. Usually under normal conditions most properties sold at auction will exceed seller expectations of their projected market value just because the property was offered to the general public at auction. Typically with a conventional sale the asking price is established and the final sells price is negoiated. This negoiated sells price is almost always reduced far from the initial asking price. When properties are sold at auction you can anticipate a final settlement within 30 days of the date on the purchase agreement. We have had cash closings within 3 days of auction. In our pre-contract interview we will discuss our procedures in detail, and we will discuss the differences in a Reserve Auction (Minimum Sells Pricing) and an Absolute Auction (Selling to the Highest Bidder) so you can make an informed decision before you offer your property to the public at auction. With auction we will make recommendations for clean up and when necessary we perform all the necessary cleanup services ourselves. If we need to hire trash dumpsters to remove excessive debris we can take care of that too. We want to work for you, and only in your best interest. If auction is not right for you we will gladly recommend other professional services which may be better suited to meet your own individual needs. Real estate agent inquiries and agent participation welcome on almost all real estate auction situations, certain restrictions may apply. To learn more about how auction may benefit you give us a call today! (812) 282-7253 or (502) 458-4815.